Melaleuca is a genus of shrubs and trees in the myrtle family Myrtaceae. There are 236 described species of Melaleuca, all of which occur in Australia. About 230 species are endemic to Australia, the few remaining species occur in Malaysia, Indonesia, New Guinea, the Solomon Islands, and New Caledonia. The best-accepted common name for Melaleuca is simply melaleuca; however most of the larger species are also known as paperbarks, and the smaller types as honey myrtles. Melaleuca provides various values for the ecosystem and for humans. They provide habitats and food for various insects and other animals, and many species are popular garden plants, both in Australia and other tropical areas worldwide. One well-known melaleuca, the Ti tree (or "tea tree"), Melaleuca alternifolia, is notable for its essential oil, which is both anti-fungal and antibiotic, while safely usable for topical applications. This is produced on a commercial scale, and marketed as tea tree oil or melaleuca oil. On the other hand, as with another Australian native plant, eucalyptus, mismanagement has resulted in unintended consequences. In Hawaii and the Florida Everglades, Melaleuca quinquenervia (broad-leaved paperbark) was introduced in order to help drain low-lying swampy areas. It has since gone on to become a serious invasive weed. Melaleuca populations have nearly quadrupled in southern Florida over the past decade, growing into forests that have eliminated native vegetation and claimed large portions of the Everglades. The genus Melaleuca is part of the Myrtaceae or myrtle family, a family of dicotyledon plants, placed within the order Myrtales. Myrtle, clove, guava, feijoa, allspice, and eucalyptus also belong here. All species are woody, with essential oils, and flower parts in multiples of four or five. One notable character of the family is that the phloem is located on both sides of the xylem, not just outside as in most other plants. The leaves are evergreen, alternate to mostly opposite, simple, and usually with an entire (not toothed) margin. The flowers have a base number of five petals, though in several genera the petals are minute or absent. The stamens are usually very conspicuous, brightly colored and numerous. Melaleuca species are shrubs and trees growing (depending on species) to 2–30 meters tall, often with flaky, exfoliating bark. The leaves are evergreen, alternately arranged, ovate to lanceolate, 1-25 cm long and 0.5-7 cm broad, with an entire margin, dark green to grey-green in color. The flowers are produced in dense clusters along the stems, each flower with fine small petals and a tight bundle of stamens; flower colour varies from white to pink, red, pale yellow or greenish. The fruit is a small capsule containing numerous minute seeds. Melaleuca is a genus that is closely related to Callistemon, the main difference between the genera is that the stamens are generally free in Callistemon but grouped into bundles in Melaleuca. In the wild, Melaleuca plants are generally found in open forest, woodland or shrubland, particularly along watercourses and the edges of swamps. Melaleucas were introduced to Florida in the United States in the early 20th century to assist in drying out swampy land and as garden plants. They have become very effective at drying wetlands and are now considered to be an ecological weed, especially in the Florida Everglades (Swearingen 2006). 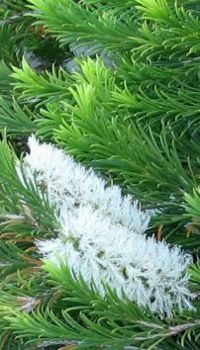 Melaleuca alternifolia, commonly known as narrow-leaved paperbark, narrow-leaved tea-tree, narrow-leaved ti-tree, or snow-in-summer, is a species of Melaleuca that is renowed for its essential oils. It is native to Australia. It is the most important species for commercial production of Tea tree oil (melaleuca oil), a topical antibacterial and antifungal agent used in a range of products including antiseptics, deodorants, shampoos and soaps. The name "tea tree" was given in 1770 by the British explorer Captain James Cook and his crew (Longe 2005). The crew used them originally for tea, but later mixed them with spruce leaves as a beer (Longe 2005). The tea-tree or ti tree is not actually very usable for making tea. Some feel that the name actually came for the brown coloration of many water courses caused by shed leaves from this species and other similar species trees. The name "tea tree" is also used for a related genus, Leptospermum. Both Leptospermum and Melaleuca are myrtles of the family, Myrtaceae. For thousands of years, Aborigines used the leaves traditionally for many medicinal purposes, including chewing the young leaves to alleviate headache and for other ailments. They would also use the leaves as an antiseptic and antifungal by crushing the leaves and making a mudpack (Longe 2005). The softness and flexibility of the paperbark itself made it an extremely useful tree to Aboriginal people. It was used to line coolamons when used as cradles, as a bandage, as a sleeping mat, and as material for building humpies. It was also used for wrapping food for cooking (in the same way aluminium foil is today), as a disposable raincoat, and for tamping holes in canoes. The medicinal properties of Melaleuca alternifolia were unknown outside the Australian aboriginal people until the early 1920's (Longe 2006). At this time, an Australian chemist, Dr. Arthur Penfold, researched its antiseptic properties, and in 1929 he published, with F. R. Morrison, Australian Tea Trees of Economic Value (Longe 2006). Dr. Penfold discovered that the oil of Melaleuca alternifolia was 12 times more potent than carbolic acid, the accepted antiseptic of the time (Kipp 1996). Penfold's work led to a flurry of research activity and eventually the role of the tea tree oil as essential for the Australian armed forces' first aid kits during World War II (Longe 2005). After World War II, however, the introduction of pharmaceutical antibiotics decreased the use of tea tree oil outside of Australia. It regained its popularity in 1960, and the growth of antibiotic resistance in the 1980s led to renewed interest in this oil. Tea tree oil or melaleuca oil is a clear to very pale golden color essential oil with a fresh camphoraceous odor. The oil is believed to have beneficial cosmetic and medical properties (including antiseptic and antifungal action). Currently, tea tree oil is obtained by steam distillation of the leaves. Although tea tree oil is normally extracted from Melaleuca alternifolia commercially, it can also be extracted from Melaleuca dissitiflora and Melaleuca linariifolia. Tea tree oil should not be confused with tea oil, the sweet seasoning and cooking oil from pressed seeds of the tea plant Camellia sinensis or the tea oil plant Camellia oleifera. Among the numerous active ingredients are terpinen and cineole. Terpinen-4-o1 is considered the ingredient largely responsible for the attributed healing properties, while 1,8 cineole is considered to contribute to disinfectant properties (Kipp 1996). Other active components are gramma-terpinene, p-cymene, and other turpines (Longe 2005). Tea tree oil is defined by international standard ISO 4730 ("Oil of Melaleuca, Terpinen-4-ol type"), which specifies levels of 14 components that are needed to define the oil as "tea tree oil." Scientific studies have shown that tea tree oil made from Melaleuca alternifolia is a highly effective topical antibacterial and antifungal, although it may be toxic when ingested internally in large doses or by children. In rare cases, topical products can be absorbed by the skin and result in toxicity. Kipp (1996) notes that the complex chemical composition of tea tree oil makes it difficult for bacteria to develop resistance, whereas traditional antibiotics possess simpler structures, allowing the easier development of immunity. It shows promise for countering methicillin-resistant Staphylococcus aureaus (MRSA), known as the hospital super bug (Longe 2005). This resists conventional antibiotics, except Vancomycin, and has grown greatly in United States and European hospitals during the 1990s. Tea tree oil is a known antifungal agent, effective in vitro against multiple dermatophytes found on the skin (Nenoff et al. 1996). In vivo, shampoo with 5% tea tree oil has been shown to be an effective treatment for dandruff due to its ability to treat Malassezia furfur, the most common cause of the condition (Satchell et al. 2002). Effectiveness of topical tea tree oil preparations for Candidiasis, or yeast infection, is supported by their ability to kill Candida in vitro (Hammer et al. 1998). Tea tree oil is likewise considered useful for treatment of athlete's foot, jock itch, rinigworm, thrush, and nail infections (onychomycosis) (Longe 2005). In the treatment of moderate acne, topical application of 5% tea tree oil has shown an effect comparable to 5% benzoyl peroxide, albeit with slower onset of action (Bassett et al. 1990). The tea tree oil is considered by some to be an effective treatment for chest and throat infections, colds, bronchitis, whooping cough, and pnemonia (Kipp 1996; Longe 2005). Tea tree oil is also effective for treating insect bites, boils, and minor wounds (Clark 1993). It has also been known to help soothe sunburns, poison ivy, ear infections, and bee stings (Clark 1993). Longe (2005) notes anti-inflammatory properties, and thus is useful for treating sprains, arthritis, bursitis, eczema, capral tunnel syndrome, and hemorrhoids. Toothpastes and mouthwashes containing tea tree oil are shown to be effective for a number of oral problems. Some of these include, halitosis (bad breath), gum disease, and canker sores (Shemesh and Mayo 1991; Walsh and Longstaff 1987; Shapiro et al. 1994). There is some limited research that has shown that tea tree oil may have anti-viral activity, especially with the Herpes virus (cold sores, chicken pox and shingles blisters, warts, etc.) (Bishop 1995). In pets, skin problems, wounds, insect bites and stings, and ringworm can all be treated with tea tree oil or products made with tea tree oil. There are some cases where pure tea tree oil placed on the skin of the animal can cause irritation (recovering quickly after discontinuing) (Small 1981). Diluted solutions of tea tree oil are sold as remedies which claim to treat bacterial and fungal infection in pet fish. Bettafix is a lighter dilution of tea tree oil, while Melafix is a stronger dilution. It is most commonly used to promote fin and tissue regrowth. The remedies are often associated with Betta fish (Siamese Fighting Fish), but are also used with other fish. It is considered to be a useful disinfectant and its solvent properties make it a good cleaning product (Longe 2005). Its antiseptic and disinfectant properties make it useful to reduce the spread of infection in hospitals (Kipp 1996). It is also considered an excellent insect repellent and to repel ticks (Longe 2005). Melaleuca oil is used almost exclusively externally. Data on oral use of tea tree oil in humans in large quantities is sparse aside from several anecdotal reports of side effects following oral ingestion (Morris et al. 2003). Symptoms may include ataxia and drowsiness. A relatively small number of people report an allergic reaction to tea tree oil, which could consist of a minor skin irritation. In a study of 725 consecutive patients, patients were patch tested with undiluted, 1% and 0.1% Tea Tree Oil. For pure undiluted tea tea oil, less than 6% of the patients observed positive reactions of skin irritation. Only 1 of 725 patients observed a positive reaction of skin irritation with the 1% dilution. None of the 725 patients observed adverse reactions with the 0.1% dilution (Lisi et al. 2000). Some people may be allergic to the cincole in tea tree oil (Longe 2006). Bassett, I., D. Pannowitz, and R. Barnetson. 1990. A comparative study of tea-tree oil versus benzoylperoxide in the treatment of acne. Med J Aust 153(8): 455-458. PMID 2145499. Bishop, C. D. 1995. Anti-viral activity of the essential oil of Melaleuca alternifolia. Journal of Essential Oil Research 7: 641-644. Clark, S. T. 1993. The Great Melaleuca Fact Book. St. Paul, MN: Gaughan Fisch. ISBN 0963952102. Hammer, K., C. Carson, and T. Riley. 1998. In-vitro activity of essential oils, in particular Melaleuca alternifolia (tea tree) oil and tea tree oil products, against Candida spp. J Antimicrob Chemother 42(5): 591-595. PMID 9848442. Hammer, K., et al. 2003a. Susceptibility of oral bacteria to Melaleuca alternifolia (tea tree) oil in vitro. Oral Microbiol. Immunol. 18(6): 389-392. Hammer, K. A., et al. 2003b. Antifungal activity of the components of Melaleuca alternifolia (tea tree) oil. J. Appl. Microbiol. 95(4): 853-860.
Henley, D., N. Lipson, K. Korach, and C. Bloch. 2007. Prepubertal gynecomastia linked to lavender and tea tree oils. N Engl J Med 356(5): 479-485. PMID 17267908. Kipp, J. 1996. The healing properties of tea tree oil. Natural Life Magazine November, December 1996. Lisi, P., L. Melingi, P. Pigatto, F. Ayala, F. Suppa, C. Foti, and G. Angelini. 2000. Prevalenza della sensibilizzazione all´olio essenziale di Melaleuca. Ann Ital Dermatol Allergol 54: 141-144. Mondello, F. et al. 2003. In vitro and in vivo activity of tea tree oil against azole-susceptible and -resistant human pathogenic yeasts. J. Antimicrob. Chemother. 51(5): 1223-1229. Morris, M., A. Donoghue, J. Markowitz, and K. Osterhoudt. 2003. Ingestion of tea tree oil (Melaleuca oil) by a 4-year-old boy. Pediatr Emerg Care 19(3): 169-171. PMID 12813303. Nenoff, P., U. F. Haustein, and W. Brandt. 1996. Antifungal activity of the essential oil of Melaleuca alternifolia (tea tree oil) against pathogenic fungi in vitro. Skin Pharmacol. 9(6): 388-394. PMID 9055360. Oliva, B., et al. 2003. Antimycotic activity of Melaleuca alternifolia essential oil and its major components. Lett. Appl. Microbiol. 37(2): 185-187. Satchell, A. C., A. Saurajen, C. Bell, and R. S. Barnetson. 2002. Treatment of dandruff with 5% tea tree oil shampoo. J Am Acad Dermatol. 47(6): 852-855. PMID 12451368. Shapiro, S., A. Meier, and B. Guggenheim. 1994. The anti-microbial activity of essential oils and essential oil components towards oral bacteria. Oral Microbiology Immunology 9(4): 202-208. Shemesh, A., and W. L. Mayo. 1991. A natural antiseptic and fungicide. International Journal of Alternative and Complementary Medicine 9: 11-12. Small, B. E. J. 1981. Effects of plant spacing and season on growth of Melaleuca alternifolia and yield of tea tree oil. Australian Journal of Experimental Agriculture and Animal Husbandry 21: 439-442. Swearingen, J. M. 2006. Plant Conservation Alliance's Alien Plant Working Group, Least Wanted: Melaleuca. National Park Service. Retrieved August 30, 2007. Takarada, K. et al. 2004. A comparison of the antibacterial efficacies of essential oils against oral pathogens. Oral Microbiol. Immunol. 19(1): 61-64. Walsh, L. J., and J. Longstaff. 1987. The antimicrobial effects of an essential oil on selected oral pathogens. Periodontology 8: 11-15. Melaleuca Australian Native Plants Society (Australia). This page was last modified on 14 September 2018, at 15:32.